some significant changes in 2018. After we’ve sampled the Anthem 2 Alu version, FRANS LE ROUX jumped at the opportunity to test the carbon bike. Back in July 2017, our regular bike tester Rudolf Zuidema sang the praises of the latest iteration of Giant’s race bike, the Anthem. The one tested was the company’s fiery red Anthem 2 aluminium version and we’ve waited quite some time to get our hands on a top-spec carbon model. Enter the Giant Anthem Advanced Pro 29er 1.
changed from 27.5” to 29” and luckily for our local market, the 2018 bike arrived ready to party thanks to its 29er wheels. 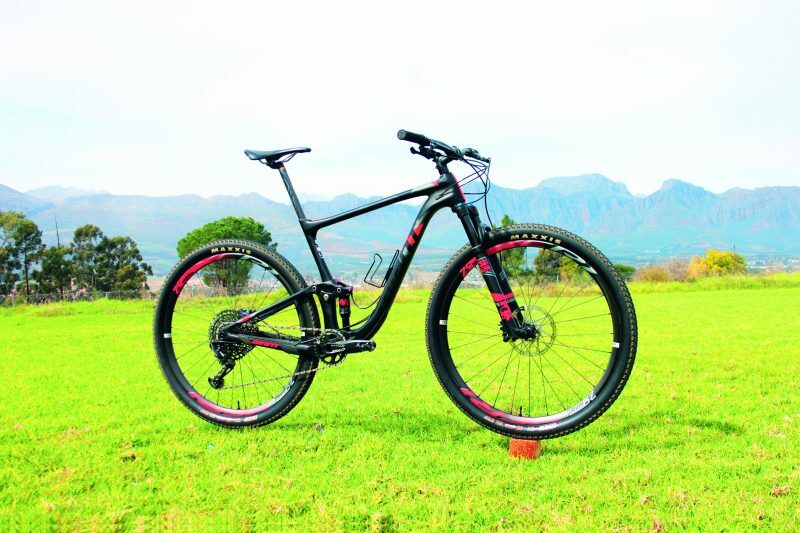 The bike I tested is the Anthem Advanced Pro 29er 1 – a very long name for a very capable bike. The Anthem Advanced features 100mm of travel in the front while at the back you’ll have 90mm. The frame is full carbon which includes the one-piece swingarm. All this carbon fibre (including the wheelset) makes the Anthem Advanced a weight weenie’s dream and the large frame I rode came in at below 10.8kg, race ready. 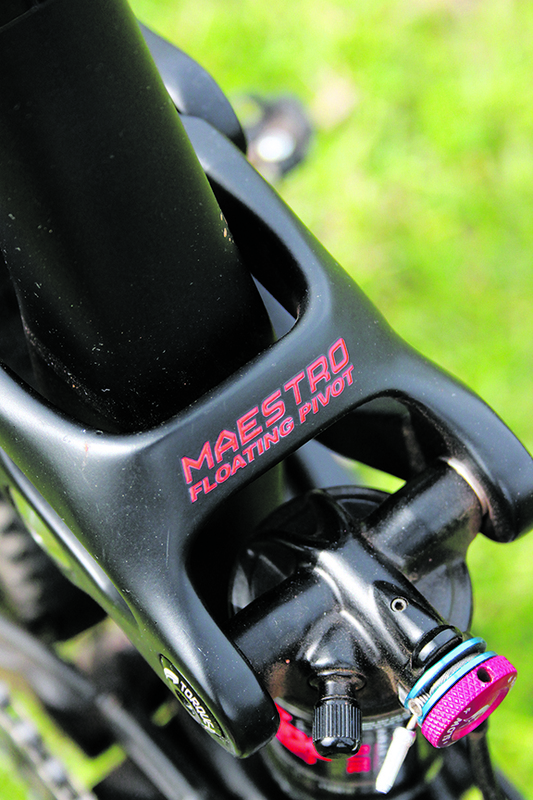 Giant’s signature Maestro’s suspension gets the job done. This is a very subjective category, but once you’re in the position to spend this much money on a mountain bike, looks are very important. Painted in black with some red Giant decals, the Anthem Advanced does well to blend its racy nature with its stealthy looks. I feel there is the right amount of red on the bike without it being overpowering. The red decals on the carbon XCR 1 wheelset blends effortlessly to complement the overall look of the bike. Priced at R73 899, you’d expect the Anthem Advanced to feature some top-end products, and you’d be right. An industry standard is SRAM’s brilliant GX Eagle 1X12 speed groupset. The massive 50t cog at the back ensures you never run out of gears and because it’s Eagle the shifting is crisp and accurate. The brakes are SRAM Level TL’s with a 180mm rotor in the front paired to a 160mm at the back. The cockpit is specced with Giant’s own products which include a 780mm Contact SL handlebar, Contact SL stem and saddle and finished off with a featherweight Contact SL Composite 27.2mm carbon seatpost. 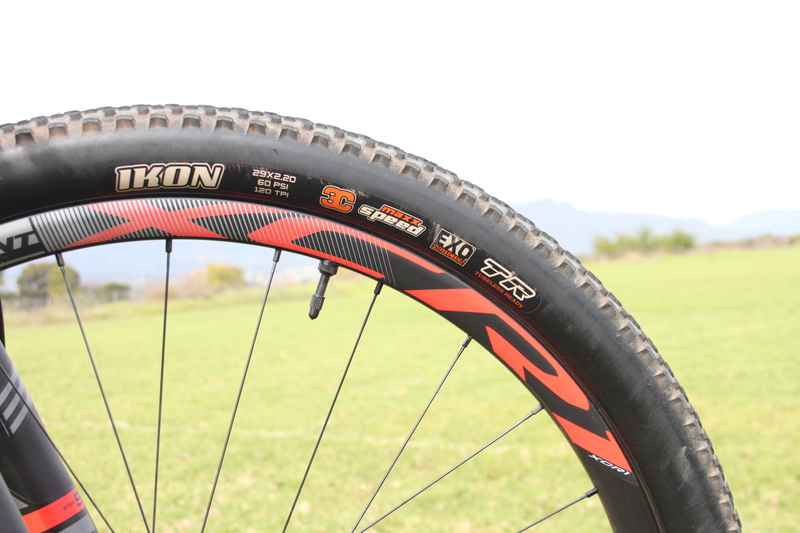 The bike comes factory fitted with tubeless Maxxis Ikon 2.2 tyres and the wheels feature Boost hubs. The suspension sees Fox at both ends with a Fox 32 Float SC Performance Elite front fork paired to a Fox Float Performance Elite at the rear. Having owned a previous generation Anthem 29er, the improvement in handling was the biggest surprise. Giant brought the geometry of the 2018 Anthem up to date with a 69,0° head angle, a 73,5° seat tube angle, a reach of 454mm and a shorter 438mm chainstay. Simply put, all this equates to is a bike that climbs better, descends like it’s on rails and corners at some speed. Having spent a month riding and racing the bike, it took me a couple of rides to dial in the suspension and my setup. Those wide 780mm enduro-like handlebars, short stem and slack head angle gave me some added confidence on the downs. My regular testing routes include Hoogekraal, Table Mountain and Meerendal. At Hoogekraal I managed a scarcely believable PB on a 10km loop. Because of the bikes low weight and proven active Maestro rear suspension, the Anthem Advanced managed to climb with the best of them. Don’t be fooled by the 90mm of rear travel. With a new carbon rocker and trunnion mounted shock, the frame is noticeably stiffer than previous models. especially considering the carbon hoops as standard. 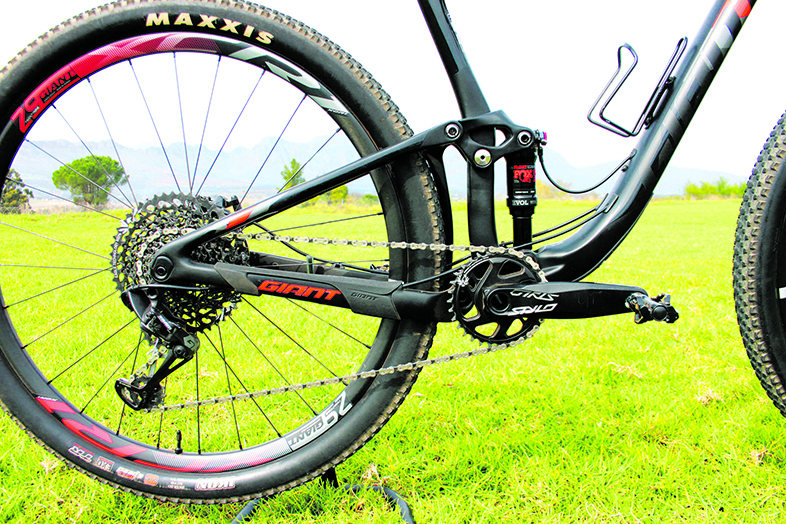 Stealth black paint and smooth shifting GX Eagle groupset finish off a top class machine. Measurements are for a LARGE frame.